CreatineTrec Crea9 Xtreme - 120 kaps. TREC CREA9 XTREME is an innovative complex creatine exceptional potential ergogenic. The combination of nine highly bioavailable form of the substance in a formulation allows faster and more active saturate muscle creatine. Thanks to this exercise re-synthesis of ATP runs much more smoothly, and the muscle fibers getting more energy. CREA9 XTREME increases physical performance in the case of successive short, very intense exercise. A preferred effect is a consumption of 3 g of creatine per day. You want to increase your strength and build an enviable muscles? Your murderous workouts require enormous amounts of energy? One of the fastest of its source is phosphocreatine, which instantly regenerates resources ATP - the basic fuel for the muscle cells. The best way to increase the level of creatine supplementation. Wondering over what her character to choose this time? Imagine creatine ideal - an innovative combination of the most modern and effective forms in one preparation. Viewing CREA9 XTREME most extreme creatine matrix containing up to 9 forms the substance selected in unique proportions. Try how it works brilliant combination and feel the power of synergy absolute! Consider it an extremely powerful product - forget about hiperdawkach and charging. Suffice 3 KING SIZE capsules twice a day! Feel the difference! Creatine is without a doubt one of the strongest and most effective legal anabolics. This is one of the few supplements that directly interferes with cellular energy system, increasing its efficiency. That is why creatine has been and is the subject of countless scientific studies. Its enormous potential support was quickly noticed by specialists in nutrition and assisted athletes. This gave rise to the golden era of creatine supplementation. Why is it so effective? Creatine is produced naturally in the body and stored in the muscles. At the time of increased demand for energy in the form of active phosphocreatine rapidly releases its phosphate moiety regenerating cellular pool of ATP, thereby enabling it to maintain the intensity of effort. Scientists have discovered that the oral dose creatine after absorption from the gastrointestinal tract via the bloodstream reaches the muscle cells. It passes through the cell membrane into them and can increase levels of creatine in muscle by 30%. What is the conclusion? The spectacular increase in the strength and the amount of energy available during the exercise. Additional saturation of creatine gives extremely powerful anabolic signal, leading directly to an increase in the rate of protein synthesis in the muscle, and thus the increase in lean body mass. The way that the creatine ingestion resides before it reaches the muscle resembles to some extent steeplechase. As each component of oral creatine also has to overcome three major barriers. The first of these is the solubility of the barrier - from the degree to which the supplement is dissolved in the digestive tract depends on how much creatine enters further. Another obstacle is the changing pH - in the stomach we have a strongly acidic reaction, in which the creatine molecule loses its stability. The main threat here is called. cyclization - at low pH extreme ends of the linear molecules of creatine may bond together and form a ring (creatinine). This compound is irreversibly loses its activity and is removed from the body in the urine, which may unnecessarily burden the kidneys. The third barrier that creatine has to overcome a cell membrane to allow movement from the blood into the muscle cell. That's why the researchers decided to improve creatine, creating its new forms and combining it with other compounds. Why are they more effective? Firstly, they are highly soluble which facilitates their absorption, the second connection of creatine with other molecules increases its resistance to changing conditions in the gastrointestinal tract. With more creatine goes to the place of real action - inside the muscle cells. Each conjugated form of the supplement (combination of creatine with another molecule) having different absorption kinetics or other additional properties. At various times since the start of the cycle up to saturate the muscles with creatine for at greatest increase muscle size and strength can be seen in a different period. What to do to creatine supplementation was even more effective? This question bothers not only scientists, but also the athletes themselves. How to create the perfect supplement creatine? How to make it not only to absorb but quickly wysycał muscle creatine? What to do to maintain its high level for a long time, and the anabolic effects of creatine were not only spectacular but also permanent? This problem set themselves specialists with professional athletes. With hundreds of hours of hard work and analysis of the latest research on advanced forms of creatine developed a unique recipe. Using the maximum synergy of the world's top forms of creatine created CREA9 XTREME. This preparation presents an innovative approach to creatine supplementation. By combining its many forms with different absorption kinetics created a product with unique properties. CREA9 XTREME is an extremely effective activator of explosive strength and muscle mass. Carefully selected doses of up to 9 best creatine chosen in such a way as to maximize the effects of the supplementation cycle. In CREA9 XTREME uses the highest quality raw materials and the most active, bioavailable and stable chemical form of creatine. Thereby is achieved by supplementation effects are not only much better, but also more stable, even at low doses. You do not need to swallow a handful of pills and many scoops of powder - just 3 capsules twice a day, because CREA9 XTREME is an extremely powerful product. Faster than traditional preparations saturate the muscles with creatine, and its increased level over a longer period. With CREA9 XTREME creatine supplementation becomes not only much more efficient, but also more economical. CREA9 XTREME owes its amazing anabolic power of the merger of the 9 best form of creatine. 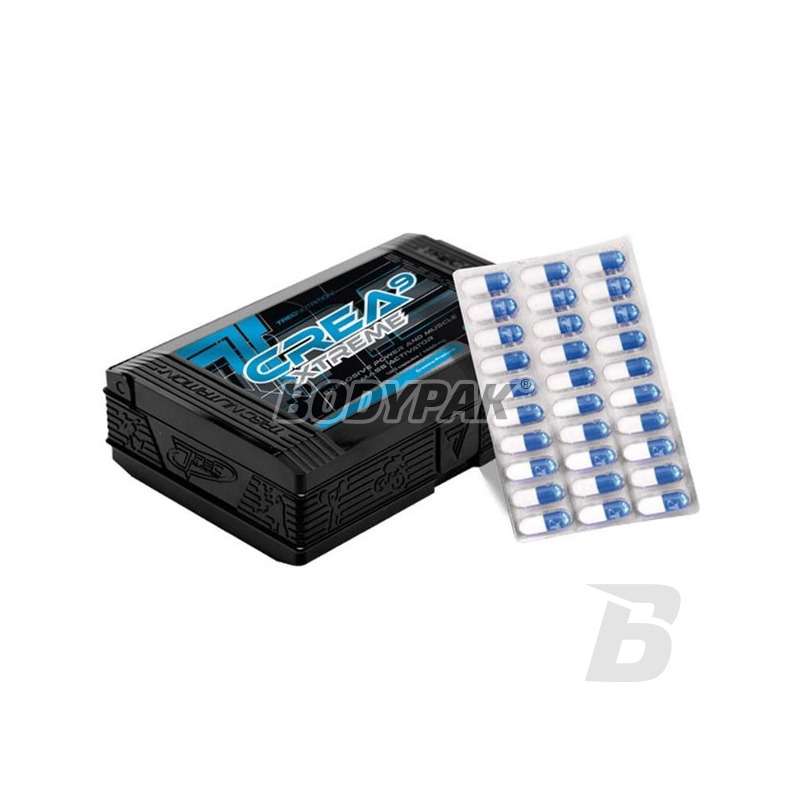 Thanks to technology KING SIZE each capsule contains up to 1250 mg a perfect matrix, Creatine - CREA-9 HYPER FUSION. Among developed by the best scientific laboratories form of this natural anabolic chose the most stable and bioavailable, which most effectively increase the intracellular levels of creatine and ATP ceiling. We used a well-soluble creatine combined with organic acids, which are natural intermediatami energetic pathways citrate malate, creatine and alpha-ketoglutarate. Statement would not be complete without great EXAMINED, micronized monohydrate. The CREA9 Xtreme also includes the innovative creatine hydrochloride - one of the most concentrated form of that component and its nitrate - which also engages in the alternative, a reverse path of the synthesis of nitric oxide (NO). Crea HYPER-9 is also FUSION ethyl ester - strongly anabolic and very stable at low pH. To increase the useful energy and the absorption of the product in its composition, there was also a combination of creatine with glucose - creatine gluconate. This is a very stable molecule endowed with additional energy potential. The whole closes effective orotate. Orotic acid improves creatine transport into the muscle cells and, in their interior provides intermediates for the synthesis of purine bases. They are the backbone for the preparation of new molecules of ATP. CREA9 XTREME is an extremely effective creatine product recommended as a universal ergogenic and anabolic. Its use is indicated both beginners and advanced players. CREA9 XTREME generates a gain in lean body mass and can achieve a significant improvement in strength and increased energy levels during workouts. The product is recommended during the period of building muscle mass and time cycles aimed at increasing strength in bodybuilders and strength athletes. CREA9 XTREME is also an excellent creatine facilitates progress in training people practicing the discipline strength-endurance, i.e. martial arts and team sports. The serving of the product - 3 capsules used 2 times a day. The preparation drink 300 ml of water. Składniki: Crea Hyper Fusion [Jabłczan Kretyny, Cytrynian Kretyny, Monohydrat kreatyny, Chlorowodorek Kreatyny, Glukonian Kreatyny, Ester etylowy kreatyny, Buforowany mnohydrat kreatyny KRE-ALKALYN, Alfaketoglutaran Kreatyny, Orotan Kreatyny]84,6%, otoczka kapsułki (żelatyna, barwniki: dwutlenek tytanu, błękit patentowy V), substancja przeciwzbrylająca: sole magnezowe kwasów tłuszczowych. Super kreatyna, godna polecenia. Dzięki niej naprawdę udało mi się nabrać więcej masy mięśniowej i siły. Polecam. Bardzo mocny stack kreatynowy, świetnie sprawdził się w okresie budowy siły mięśniowej.